OOH company JCDecaux will be revitalising Jewel Gateway advertising site at ION Orchard, with a back-lit lightbox amplifying visibility from all directions. Located at one of the busiest link ways along the Orchard belt, the newly installed illuminating lightbox was upgraded from the original sticker bleed to offer maximum exposure to its high traffic audience and shoppers. The Face Shop is the maiden advertiser promoting its limited edition Christmas gift sets for this festive season. Late last year, JCDecaux Singapore launched a new digital advertising network at ION Orchard. This came following the successful launch of the “Digital Fashion Network” in July. 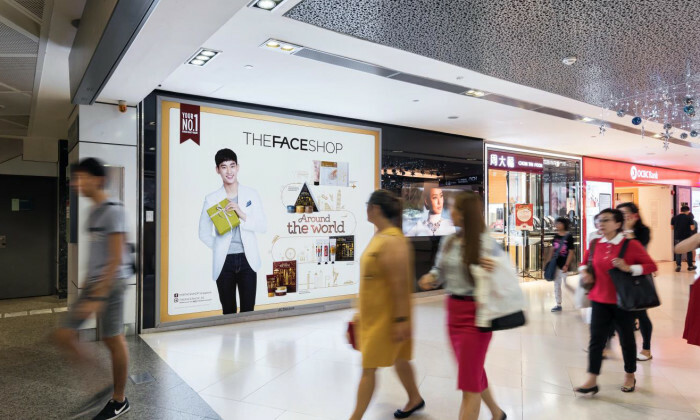 JCDecaux unveiled a new Network of 80-inch digital screens in the mall, packaged as the “Premium ION Link Digital Network”. The network waslocated at key touch points along the busiest linkways of Orchard Road, the brand new network comprises of nine screens and maiden advertisers include H&M, Juicy Couture and PuTien. How can we defuse this technological arms race? And what should we do to encourage people to embrace advertising again? .. Taking home a total of 6 out of 15 Hong Kong Awards and 1 North Asia Award from the Yahoo Big Idea Chair Awards 2016, Webs S’up wa..